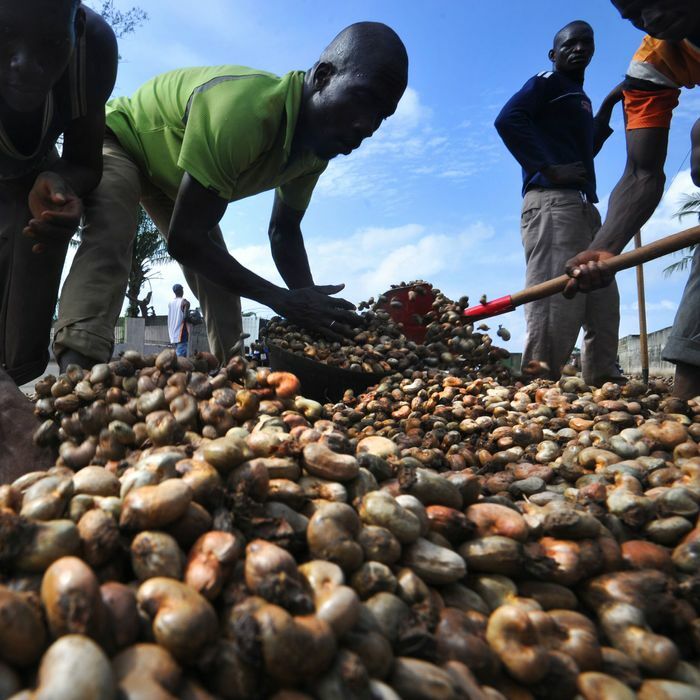 In The Telegraph today, Consider the Fork author Bee Wilson writes that the notoriously bad plight of cashew harvesters isn’t getting any better, even as the nut’s popularity climbs. In fact, while blood is the last adjective anybody wants preceding a commodity, whether that’s diamonds or nuts, growing demand has meant increased pressure on the workers living in India and Vietnam. In India last month, a group of 17,000 workers went on strike, demanding a 70 percent pay increase. Right now, these workers earn about $2.50 for a ten-hour day. Beyond bad pay, though, the nuts are hard to extract, and while doing it, workers are in contact with two corrosive substances found in the shells (cardol and anacardic acid). To top it off, their employers rarely provide gloves, leaving them with permanent hand damage. Meanwhile, conditions in Vietnam “may be even worse than in India.” Despite years of petitions and exposés; by groups like Human Rights Watch, Vietnam hasn’t quit using cashew production as a form of drug rehab, where “treatment” apparently consists of forced labor and electric shock. There may be a silver lining to the demand, too, though: In places like the Ivory Coast, where production is also way up, cashew harvesting has created an “astounding” number of new jobs. Plus: The government is finally considering processing the nuts itself, instead of shipping them to India and Vietnam, where, right now, 95 percent of them end up.